Choosing the perfect wedding ring is one of the most memorable and fulfilling moments in a relationship. Are you looking for an experience that is intimate, and something more than the local jewelry store provides? 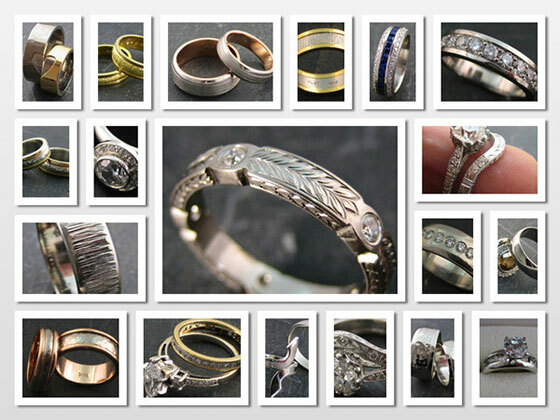 If so, the Do-It-Yourself Wedding Ring Workshop at Whaley Studios is for you! Jay Whaley, master jeweler and goldsmith with more than 50 years experience in the industry, offers a unique and special way for couples to design and make their own custom wedding rings in a single day at Whaley Studios in beautiful San Diego! No special training or skills are needed! At Whaley Studios, couples who choose the Do-It-Yourself experience are guided every step of the way from the design process to the finished piece. You’ll begin your journey with a complimentary design consultation with master jeweler, Jay Whaley, who will help you select the metal for your rings, assist with stone choices that enhance your design if you choose, and provide pricing information. This is your opportunity to create unique and deeply personal custom rings, designed to mark a special and significant time in your lives! Your special day begins at our studio office for a brief meeting with Jay where he will measure your ring size, confirm metal choice and design details. Moving on to our well equipped studio, Jay will then guide you every step of the way through centuries-old classical metalsmith techniques from melting and pouring metal for your custom rings, right through the final polish! Nothing here is pre-made. Couples make their custom wedding rings from scratch! You will also be treated to a fun lunch with Jay on our balcony patio. We’ll end the day with a champagne toast to celebrate your special day! Rings can be made from platinum, 18K or 14K Yellow, White or Rose Gold, or a proprietary, high-tech sterling silver. Diamonds and colored gemstones can also be incorporated into your wedding ring design. These details will be discussed during your complimentary workshop consultation. The one-day Wedding Ring Workshop includes the precious metal used to make your custom rings, uninterrupted use of our studio and equipment for the day, dedicated one-on-one guidance from master jeweler, Jay Whaley, lunch on our balcony and a champagne toast at the end of the day, and your finished custom wedding rings! For more information about our Do-It-Yourself custom Wedding Ring Workshop, or to schedule your complimentary consultation where you can discuss design options, metal choices, pricing options and ask questions, please call us at 619-299-9619 Monday thru Friday 9am to 6pm Pacific Standard Time. OR, email us at whaleystudios@gmail.com. Feel free to include images of ideas you have about your custom design in your email, we’d love to see what you’re considering! The rings in our gallery were made by couples who had never made rings before coming to Whaley Studios! Their designs are expressed as wedding bands made by each other (some of our clients make their own ring, and some make each other’s ring) to create custom, unique and personal rings to last a lifetime! Enjoy! Please contact us at 619-299-9619 or email us at whaleystudios@gmail.com We look forward to hearing from you!